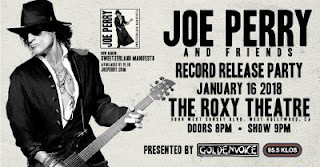 Joe Perry, legendary guitarist, co-founding member, principal songwriter and co-producer of Aerosmith, and his all-star band crushed it at a two-hour plus set this past Tuesday (January 16) at The Roxy Theatre in Los Angeles, CA. Joe was backed by guitarist Dean DeLeo and bassist Robert DeLeo (Stone Temple Pilots), Buck Johnson (keyboards/vocals/Aerosmith) and David Goodstein (drums) who performed the entire set that also featured guest appearances by Slash and Johnny Depp. Gary Cherone (Extreme/Van Halen) handled vocals for the bulk of the show, with other guest vocalists also lighting up the Roxy: Terry Reid, David Johanson, Robin Zander and Chris Robinson.